Saturday, October 15, 2016, from 6:30pm - 8:00pm. On the full moon night of Saturday, October 15 bring a flashlight and meet us at the Nauset Light Beach parking lot, off Cable Road in Eastham for our annual Full Moon Tour of Nauset Light. Let us show you the magic of the full moon at Nauset Light. Moonrise over the Atlantic is at 6:00pm. If you can't join us for the full moon, our Sunday afternoon tours continue through October 30 from 1-4pm. Our 2016 tour schedule begins Sunday, May 8 on Mother's Day. We will then be open for tours every Sunday through October 30 as well as Tuesdays and Wednesdays in July and August. With our new Tuesday tours in July and August we have 44 tour dates this year, all hosted by volunteers. We hope to see you at one of them. At the annual meeting of Nauset Light Preservation Society held on December 4, 2013, David M. Gray retired as president. David served four accomplishment-filled years during which time he initiated the complete refurbishment of the light, both inside and outside, thus improving every visitor's experience. David was responsible for contacting Snyder's-Lance, the owner of Cape Cod Potato Chip Company, to assist NLPS in funding the cost of painting Nauset Light. The lighthouse is featured on the Cape Cod Potato Chip bag. Snyder's-Lance graciously paid the entire cost of $42,000. See the June 2013 update below. A wreath is hung on the lighthouse every year at Christmas. This year, the board of directors of NLPS voted unanimously that from now on, the wreath will be known as "The David M. Gray Christmas Wreath" in honor of David's many contributions to NLPS. It has been a very busy winter and spring for NLPS. Denise Czapracki, a long-time lover of Nauset Light, passed away in November 2011. Her family and friends chose to honor Denise by making memorial donations to NLPS. 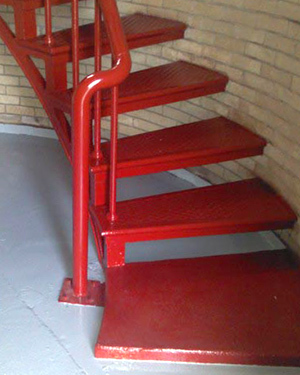 Through their generosity, we were able to move forward with the repair and repainting of the iron stairway from the base of the tower to the watch room. A contract was signed with J. J. Welding of Wellfleet, and the work was done during this past winter. The concrete floor at the bottom of the tower and the underside of the watch room floor were also painted, so the interior of Nauset Light is in excellent condition once again. We are grateful to the Czapracki family for providing us the opportunity to complete this much-needed project. The exterior of Nauset Light was last painted in the fall of 2006, and was in need of a new coat of paint. The cost was estimated to be $40,000, a large amount of money for our small group of NLPS volunteers. Our president, David Gray, contacted the president of Snyder's-Lance, the owner of Cape Cod Potato Chips, and asked whether they would consider sponsoring our project, since Nauset Light is pictured on their Cape Cod Potato Chips bag. The president liked the idea, and Snyder's-Lance agreed to provide up to $40,000 for the exterior painting. We gratefully accepted and promptly began the project. Bids were received, and International Chimney Company of Buffalo, New York, the company that moved the light in 1996 and repainted it in 1997, was selected. Work began in May and was completed in early June. Because of several unforeseen repairs. the final cost was $42,000. Snyder's-Lance generously paid the entire amount. We sincerely appreciate the willingness of Snyder's-Lance to underwrite this very important project. Nauset Light is now beautifully restored on both the inside and outside and we are proud to show it off. On April 28th, the American Lighthouse Federation presented Nauset Light Preservation Society with the 2012 ''Keeper of the Light'' Award. At the A.L.F. annual Awards Gala held this year at the Sheraton in Eastham, MA. NLPS was one of only two lighthouse organizations honored this year with the American Lighthouse Federation's ''Keeper of the Light'' Award. With photos and excerpts from our video/DVD ''Rescued'' being projected onto a screen in the background, ALF's Executive Director Bob Trapani recounted to the over 110 members and representatives of lighthouse organizations with stewardship responsibilities for over 22 lighthouses the story of how NLPS had saved Nauset Lighthouse from destruction, moved it to its present location, and now operates, maintains, and interprets it to the public. Click here for more on the American Lighthouse Foundation and the full text of the speech. Left Photo, Eric Davis, President American Lighthouse Federation; Shirley Sabin, NLPS Secretary; David Gray, NLPS President; Carl Ericson, NLPS Treasurer; Bud Griffin, NLPS Board member; and Bob Trapani, Executive Director ALF. Our New Video: "Nauset Light and the NLPS"
A new video about Nauset Light was filmed and edited by Chris Szwedo, owner of Szwedo Productions, a company that makes a variety of high quality documentaries and videos for corporate training. Chris is a volunteer with Nauset Light Preservation Society. Many thanks to Chris and also to Dave Gray for his narration. The video is also on view in the oil house during tour hours. With deep regret the Nauset Light Preservation Society announces the death of Pam Nobili of Eastham, Mass. on May 31, 2011. Nearly 20 years ago, Pam Nobili and her husband, Conrad, were deeply involved in the effort to save Nauset Lighthouse, which was endangered by severe erosion of the nearby coastal bank. Through their actions, along with other concerned citizens of Eastham and Cape Cod, the Nauset Light Preservation Society was formed, and sufficient funds were collected to pay to move the Lighthouse, Keeper's House, and Oil House to a safer location from 1996 to 1998. The Nauset Light Preservation Society has operated and maintained the lighthouse since the move, and Pam continued to play a significant role: for many years Pam operated NLPS' extremely successful gift shop, which provided a large share of the funds collected for the move and for future operations and maintenance; she served as the Society's President for several years and most recently she was the Society's Treasurer. Pam came to be known as "Mrs. Lighthouse" for all her efforts and for her constant presence at the light. We shall all miss Pam Nobili's charm and good humor and her devotion to the cause of the Nauset Light Preservation Society. Visiting hours will be at the Nickerson Funeral Home, 77 Eldredge Park Way in Orleans on Wednesday, June 15, 2011, from 3 to 6 p.m. Remembrances will begin at 4:30 p.m. In lieu of flowers, the family requests that donations be made to the Nauset Light Preservation Society, P.O. Box 941, Eastham, MA 02642. 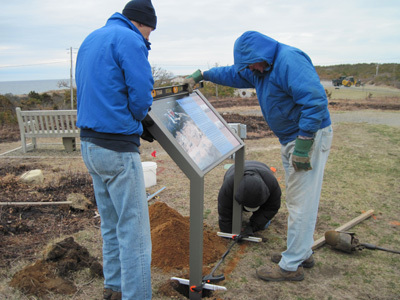 Over the past year, a sub-committee of NLPS board members has been working on the design and creation of a wayside exhibit at Nauset Light. The lengthy process has been completed and the exhibit was installed at the lighthouse on March 31, 2011. The grounds of the lighthouse are open daily year round allowing the public to visit the site, even when the tower is not open for tours. The new exhibit helps visitors understand the effect of erosion that over the years has made it necessary to move the lighthouse and other structures away from the cliff to save them from the ravages of the sea. Good news! 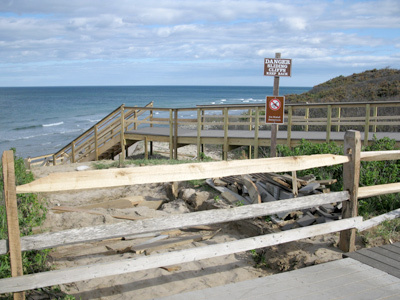 The park has installed the new stairs to Nauset Light Beach just in time for the summer season. Hopefully, they will last for a number of years before they are once again taken by the sea. See the March 2010 Update below to view the demise of the previous stairs. Nauset Light tours began on Mother's Day and will continue until the end of October. Click here to view the dates and times. The park has added a new feature to its www.nps.gov/caco website - cell phone interpretation of a number of sites within Cape Cod National Seashore. To listen to the segment for Nauset Light, dial 508-718-6054 on your cell phone, and when directed, select #7 for a ninety-second message about the Nauset Light Station and its history. We are looking forward to a busy and successful season. Plan a trip to the light when we are open, climb the tower, and then enjoy viewing our exhibit in the restored oil house. The winter has been a difficult one with serious erosion occurring all along Cape Cod National Seashore. At least four major storms with high winds and lasting several days have pounded the shoreline. A full moon resulting in higher than normal tides added to the fury. The stairs at Marconi Beach in Wellfleet (photo 1) and Eastham's Nauset Light Beach near the lighthouse (photos 2 & 3), as well as part of the walkway at Coast Guard Beach, were washed away during the last storm of Friday, February 26 to Monday, March 1, 2010. In addition, the bicycle bridge connecting the bicycle path from Salt Pond Visitor Center to Coast Guard Beach was washed over. It is now unsafe and must be replaced. Nauset Light was moved in 1996 because it was less than 35 feet from the edge of the cliff. Immediately after the move, a 4'' x 4'' post was put in the ground marking where the center of the light once was. Due to the continuing erosion of the shoreline during the last 13-1/2 years, the post is now a foot or less from the edge of the cliff. It is expected that it will disappear soon. As can be seen in the last photo, had the lighthouse not been moved, it would have been dismantled and taken away long ago. Thanks to the many members, friends, and supporters of the Nauset Light Preservation Society who contributed funds to move it, Nauset Light is safely away from the edge of the cliff and is still shining brightly. Ongoing support of NLPS is crucial to its ability to keep the lighthouse lit and maintained.